The OC Real Estate Guy's Homepage for Rossmoor. Community, History, Search Listings. Start your research here. Rossmoor has a thriving and tight-knit community. Public services, a library, schools and parks are just the beginning for this picturesque town. The Real Estate market is thriving in Rossmoor. See the stats and check out the original floorplans of Rossmoor. Rossmoor may have been developed in the late 1950's and early 1960's, but the town's story really began in 1888. This was the year Rancho Los Alamitos was divided amongst the heirs of John Bixby. The area now called Rossmoor was smack-dab in the middle of the ranch and was the site of John Bixby's home where he lived with his wife and children. The land was used to grow sugar beats and other crops until a developer named Ross Cortese arrived on the scene with a more ambitious plan for the area. Recognizing a growing need for housing in Southern California, Ross put into motion his plan to build an exclusive community of 3,500 homes. At the time, this was the largest home building project to take place in Orange County. Construction began in 1956, and by 1957 Rossmoor's first homeowners were moving in. At price points of $17,000 and $20,000, these pioneering residents had no idea what kind of bargain they were actually getting. Rossmoor's history is littered with failed attempts to incorporate the neighborhood into it's own city or annex it to a neighboring city. When Rossmoor was first being built Ross Cortese put fourth a plan to incorporate Rossmoor, but residents requested a year to review alternative options. Alternatives including annexing to Seal Beach, Long Beach, or incorporating together with Los Alamitos which was also unincorporated at the time. In 1961 the prospect of incorporation was voted down and property owners were hit with a property tax increase from $383 to $471. There was also an attempt to annex to Los Alamitos in 1962, which was defeated a year later. Meanwhile, as nobody watched the till, Seal Beach scored a large coup by annexing the Rossmoor Business Center and adjacent undeveloped land, a total of 5 9 acres. This was done with the help of the Orange County Local Agency Formation Commission (LAFCO), the land owner (Judge Gittleson of school-bussing-for-integration fame), Supervisor David Baker of the 2nd District, and Seal Beach City Manager Lee Risner. Opposed to the annexation was the Rossmoor Homeowners Association and the City of Los Alamitos. The Rossmoor Homeowners Association had obtained 2,600 signatures in opposition. This is how the shopping center (and tax base) was lost; the loss is still a painful memory to the residents of Rossmoor. Even the Los Alamitos-Rossmoor Library is in the territory annexed by Seal Beach. Things finally cooled off for Rossmoor after an annexation attempt by Los Alamitos in 1979. The city petitioned the Local Agency Formation Commission (LAFCO) for annexation of Rossmoor's Northeast shopping center, Rossmoor Village. The petition was shot down, and LAFCO ruled that that all further annexation moves by nearby cities would be denied unless the residents of Rossmoor welcomed it. In 2008 a Rossmoor incorporation plan was put fourth by LAFCO and put to a vote. The residents of Rossmoor overwhelmingly voted against incorporating into a city 72% to 28%, and also shot down three separate utility tax proposals. Almost none of the homes in Rossmoor are in their original condition. The last home constructions were finished in 1962, and ever since then residents have been moving in and remodeling, adding square footage, adding floors, upgrading materials, etc. 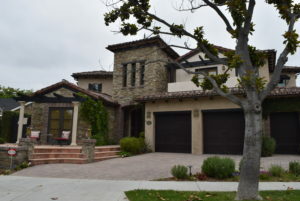 As an unincorporated area of Orange County, construction in Rossmoor is not bound by the same mountains of building codes and red tape that you would typically find in a city-planning department. You are limited only by the building and use codes put fourth by Orange County. So if you have some serious home customization plans, Rossmoor might be the place for you.